Been using a lot of Mahara recently as we develop more confidence in using it as our e-portfolio tool of choice to present, store, share and assess students work. I am now using Mahara in my Year 7 and 8 ICT lessons. In Year 7 we embarked on a topic called Formulas for Fitness. In essence it is a topic on spreadsheets where the focus is PE and students developing their skills by developing and presenting fitness data about themselves and other Year 7 students (students carry out 5 different fitness tests from reaction timers, co-ordination tests which are gathered via a Google Form to produce data of 200+rows). 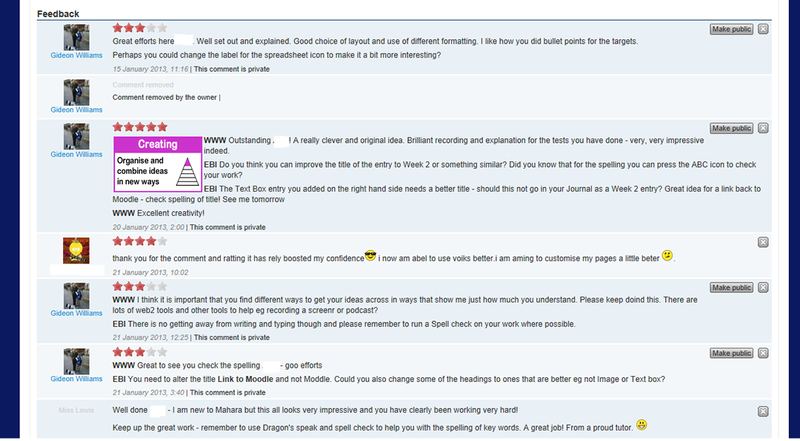 I enjoy giving feedback on Mahara. As a site admin I can enrol as students. This allows me to create a “secret URL” which I can send to other teachers for surprise comments (in this case his tutor). Later I will get students to share pages to provide monitored peer review of their work. Lots of great IT skills using Mahara from linking images, embedding code and presenting work. I have used Mahara as the company intranet. 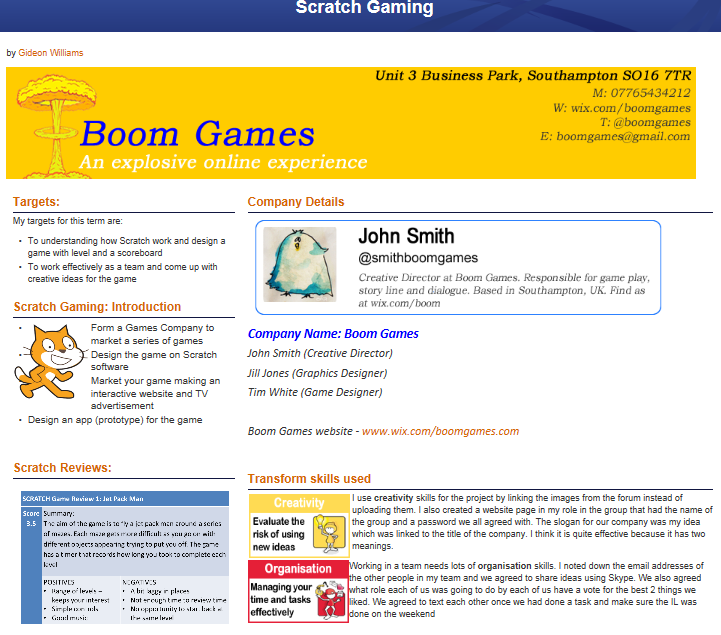 Part of the students page is given over to explanations of what they have done each lesson. In the case below making a twitter ID, letterhead, logo and slogan. Students in Year 8 also take a transformational learning course and I have asked them to signpost the PLTS skills in their work. The example below is mine as its too much of a hassle to erase all the personal details. Later on I will get students in each company to share their pages for further comments. The BIG news this week is the release of the Scratch plugin for Mahara. This is the result of some greate work from Gregor Anželj who actually released the original version sometime ago but no-one apparently came forward to test it. After some posting and cross-posting, Gregor has updated the version for Mahara v1.5 and 1.6 and its now good to go. Here is a silent Screenr post about it. Does it work with multilevel games? Online backup, file sharing and synchronising. Heard about this a while back but never used it – what a big mistake that was. Have it installed on laptop and school network and home. Files are uploaded to the cloud and synchronised so that I dont need to carry them in a memory stick. Up to 3GB storage free with option to extend to 5Gb if you start recommending lots of people. I store all the helpsheets in here and just send someone a link to them. You can now upload folders to the cloud (although sharing them is a bit complicated) – not blocked in Hampshire!! Adding files from home to be read at school take a lot longer than when you add files at home to be read in school. 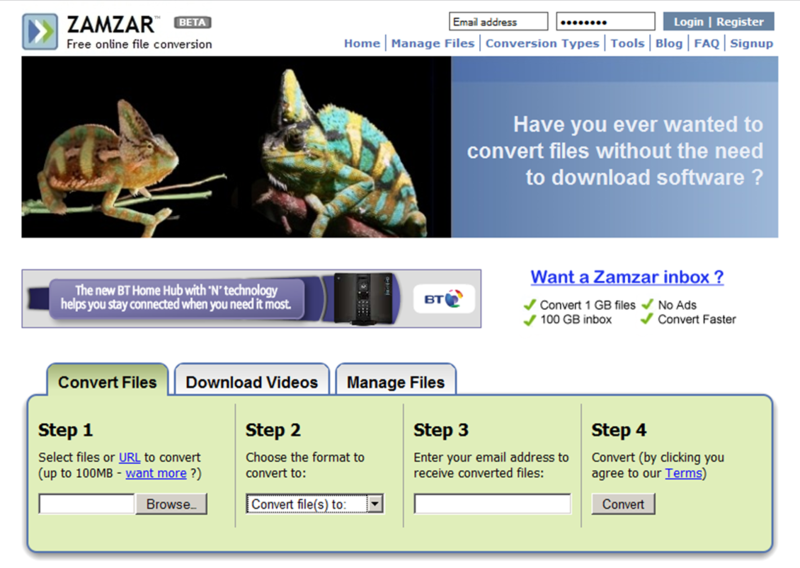 Convert files up to 100Mb for free! Many other free conversion software available – see later. Brilliant site which does exactly what it says. 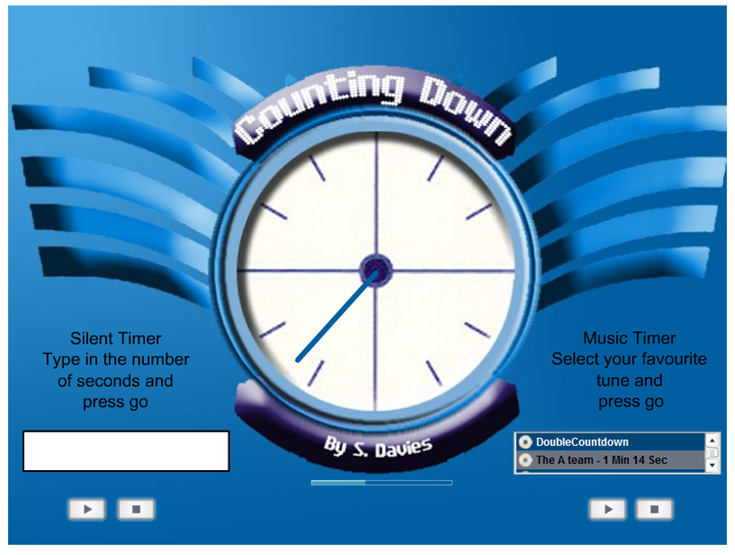 My particular favourites are the Countdown clock whose settings can change depending on which mp3 file you link to. Also available are templates for certain quiz types. 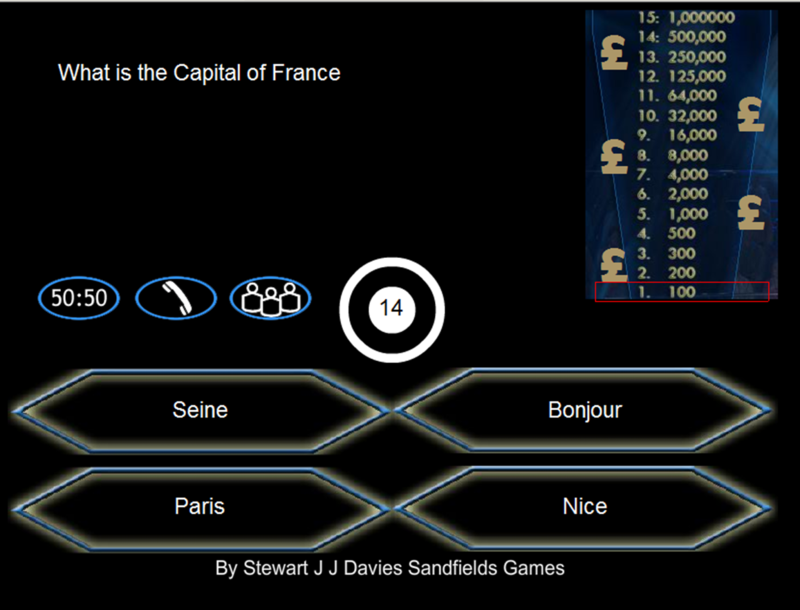 The Millionaire quiz is a flash template with an xml file that you can edit. 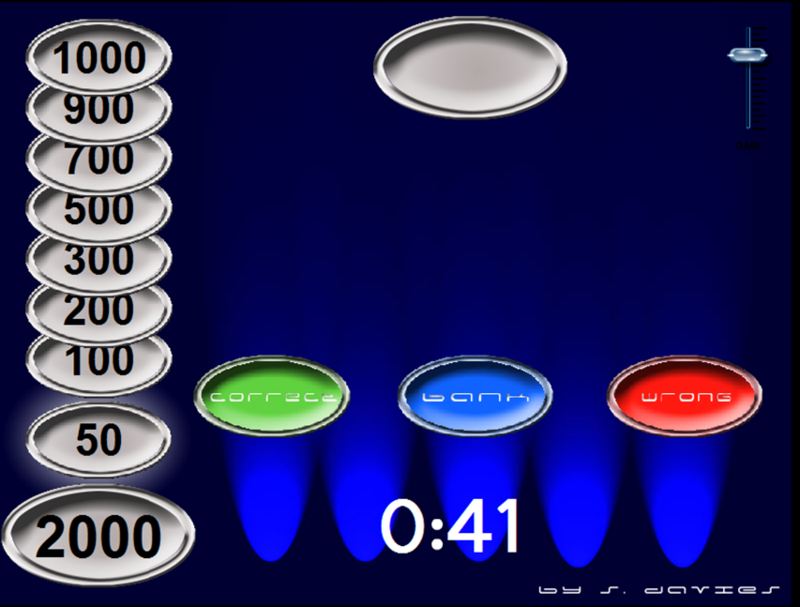 There is also a template for playing Weakest Link and a PowerPoint for other quizzes.